1950: The Giants rise back to the top of the newly re-christened American Conference, and put together a solid 10-2 season beating the Cleveland Browns twice. However, the Browns also finished 10-2, forcing a playoff game for a trip to the NFL Championship Game. Making matters worse is that the Giants lost a coin toss, and the game was played in Cleveland where the Browns and Giants met in a Defensive struggle, in which the Browns emerged victorious 8-3. 1951: The Giants put together another solid 9-2-1 season. However, both losses would come at the hands of the American Conference Champion Cleveland Browns. 1952: The Giants would fall one game short of first place as they posted a 7-5 record, in which they beat the first place Cleveland Browns twice. However a home loss to the last place Washington Redskins in the next to last week of the season would prove costly. 1953: While one era was ending another one was beginning for the Giants. Coach Steve Owen would retire after a disappointing 3-9 season. Owen’s coaching career began as an interim head coach in 1930; his career would span the pre-modern era through the depression, and past World War II into the 1950’s where the league was on the verge of exploding. While, the Giants were scuffling along a light of hope was not hard to find as second year all-purpose back Frank Gifford had a breakout season leading the Giants in Touchdowns with seven. 1954: In Jim Lee Howell’s first season as head coach the Giants get off to a solid 6-2 start, and are in the thick of the race for the Eastern Conference Title. However, threee losses in their final four games ended any playoff aspirations. 1955: The Giants hopes for the playoffs end quickly as the Giants lose five of their first seven games. However, the Giants would not lose another game and would head into the off season with a 6-5-1 season to build off. 1956: After 31 seasons at the Polo Grounds the Giants leave the crumbling old ballpark for Yankee Stadium. In their first season at Yankee Stadium the Giants jump out of the gate quickly winning six of their first seven games. The Giants would go on to finish with an 8-3-1 record, which was good enough to capture the Eastern Conference Title. Leading the way was Frank Gifford, who earns the NFL MVP with a nine Touchdowns and 1,422 all-purpose yards. In the first NFL Championship Game played at Yankee Stadium the Giants would face the Chicago Bears. The game was over by halftime as the Giants established a 34-7 lead, on the way to a 47-7 victory. Leading the way for Big Blue was Quarterback Charlie Connerly, and bruising Fullback Alex Webster who walked all over the Bears all day. The Championship proved perfect timing for both the league and the Giants as the NFL was about ready for an explosion in popularity, and at the forefront was the New York Giants, who were quickly becoming household names. The NFL was eager to promote its stars, and with Madison Avenue knocking on the door, the Giants became the most recognizable team in the NFL, as stars ranging from the matinee idol Frank Gifford to the rugged Sam Huff landed in advertisements. However, two bright stars toiled in anonymity on the Giants coaching staff. Working under Coach Jim Lee Howell was Offense Coordinator Vince Lombardi, and Tom Landry who guided the Defense each would go on to establish legendary Head Coaching careers. 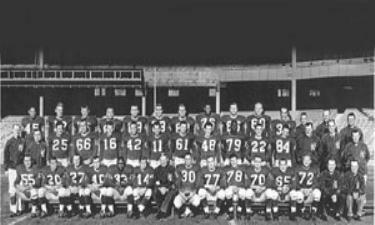 1957: After losing the season opener to the Cleveland Browns the Giants bounce back and stand at 7-2 after nine games. However, the quest for a second straight NFL title ended with three losses to close out the season at 7-5. 1958: Through the first 11 games the Giants stand at 7-3, but still trail the Browns for first place in the Eastern Conference by a game. This set the stage for a season finale showdown with the Browns in the final game of the season at Yankee Stadium. The Giants would edge the Browns 13-10 to force a showdown for the Eastern Conference a week later. In the rematch at Yankee Stadium the Giants defense led by Sam Huff would completely shut down Jim Brown, to aid the Giants to a 10-0 victory to advance to the NFL Championship Game. The NFL Championship Game at Yankee Stadium saw the Giants taking on the upstart Baltimore Colts led by young Quarterback Johnny Unitas. The game was also a showcase event as it was the first time a major Television Network featured an NFL Championship Game. Millions would tune in, as the NFL was about rise from the shadows. With a crowd of 64,185 on hand at Yankee Stadium, the Giants jump out to a 3-0 on a 36-yard Pat Summerall Field Goal. However, the Colts would score twice, and would head into halftime with a 14-3 lead. The Giants would get back into the game on a one yard plunge by Mel Triplett, which was set up by an 86-yard gainer from Charlie Conerly to Kyle Rote with Alex Webster picking up Rote’s fumble. The Giants would later take a 17-14 lead on Conerly’s 15-yard Touchdown throw to Frank Gifford. However, with seven seconds remaining Colts Kicker Steve Myrah nailed a 13 yard Field Goal to knot the game at 17-17. Time would run out and at the end of 60 minutes nothing was settled, and for the first time in NFL History Overtime was needed to decide a game. The rules were simple the first team to score won, and thus it was important to get the ball first. The Colts would win the coin flip, but would not score on their first possession. After the Giants failed to score on their first possession the Colts got the ball back and drove it the length of the field, and won the game on a one yard Touchdown plunge by Alan Ameche. The Colts would win the NFL Championship, but the game won over new fans, and set the stage for the NFL’s explosion in popularity. To this day many experts still believe it to be the greatest game ever played. 1959: The Giants cruise to the Eastern Conference Title with a 10-2 record, as Quarterback Charlie Conerly takes how the NFL MVP. The Giants Conference Championship set the up in a NFL Championship Game rematch with Colts in Baltimore. The Giants would take a 9-7 lead into the 4th Quarter, but the Colts would go on an offensive explosion to pull out a 31-16 victory. I can’t wait for manning bowl 2. it will be a great test for our new d- coordinater to try and stop older manning. Besides I will love to see how our O-line does against there pass rush Beatty vs freeny. I can’t wait. If our running game ever comes back we have a great shot at a victory. The giants are at home right? I’m sure they will be.